SOLD WAS: $28.50 NOW: $22.00 Much of the Spanish Toledo jewelry was unmarked. 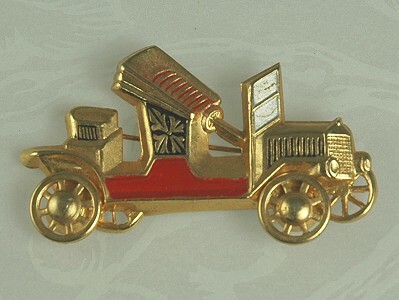 This pin of an early automobile is marked Spain. Red, black and white enamel along with excellent detailing [no pun intended] of the burnished gold- tone metal make this car ready to roll out! Condition: Excellent vintage. Very, very minor enamel loss. Measurements: 2 1/4" wide and 1" long.